Embest Mini8100 processor card is designed specially to be the heart of your next embedded design. The tiny board integrates TI OMAP3530 processor (ARM Cortex-A8 Core ~600MHz paired with a TMS320C64x+ DSP ~430MHz). 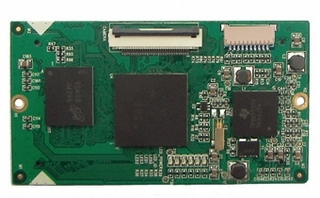 The processor card takes use of all common features of OMAP3530 and the connection between the processor card and your carrierboard is through two 1.27mm space 90-pin biserial dip connectors. 16-bit data bus, I/O and all other hardware interfaces are all expanded via these two connectors. The fully expansion can be used adapted to customer requirements. Integration of the Embest Mini8100 processor card to customer special design is fully supported by Embest technologies. Embest designed an expansion board which can fully evaluate Mini8100. The whole system is called SBC8100. Embest offers Linux 2.6.29 and WinCE6.0 BSP for this board. Embest also offers a kind of video solution device VSS3530 which designed based on Mini8100 targeting Video output, Image Acquisition, Image Processing, Video monitoring and more other applications. Customers can leverage our experience to increase your own productivity. The optimal embedded microprocessor solution provides users with a flexible development environment based on OMAP3530 and a shortened development timeframe.